If your goal is to rapidly build muscles and shed fats safely and effectively, use Lucky SARMs by MedFit Rx for guaranteed best results. SARMs offer the benefits of traditional Anabolic Androgenic Steroids such as testosterone including increased muscle mass, fat loss, and bone density, all the while, offering a much lower tendency to produce the unwanted side effects that come with steroids. S23 15mg – proven to increase muscle mass, reduce fat mass, and has a very high binding affinity to the androgen receptors. 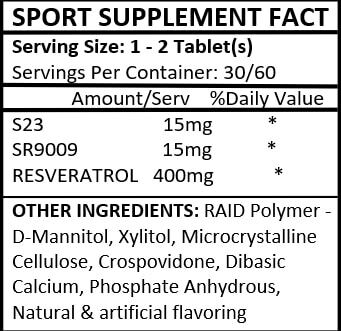 SR9009 15mg – improves metabolism, greater endurance, and increases in strength. RESVERATROL 400Mg – significantly increases heart health, vitality, and lifespan. Want bulging biceps and a bigger chest? Accomplish all of your fitness goals for a stronger, healthier and more muscular body with Lucky SARMs by MedFit Rx! Suggested use: 1 tablet taken daily by Women, 2 tablets taken daily by Men.